The chatter among the dinner guests was bubbling along nicely, when Alistair Townsend suddenly clutched at his chest, made gurgling sounds and slumped into his bowl of escargots. This mystery is in the vein of the classic holiday whodunit. Cait Morgan, a professor of criminology in Vancouver, Canada, is visiting Nice, France for the weekend. The murder pulls you into the story right away, and discovering who the dinner guests are and the secrets they guard keeps you turning pages. The setup is ideal for the whodunit mystery – Cait is an outsider, who happens to be at the fatal dinner by a twist of fate. She knows she did not kill Alistair, but one of the five dinner guests must have. To top it off, Cait is considered a suspect by the French police, and cannot travel home until someone is arrested for the crime. Knowing this, she takes matters into her own hands to try and name the killer. Cait has a few tools working for her (and the reader) throughout the novel – the first is an ability to read people. She can sense the unspoken and has insights into how people are really feeling. The second is she has an “eidetic memory” (some people call it a “photographic” memory). Meaning that Cait has an exceptional memory, not forgetting events, and can even close her eyes and “relive” moments in her mind. We follow Cait talking to and observing the suspects, picking up clues as we go. She gathers a lot of information – some of it important to the mystery, some of it misleading – but it all does come together in the end. The only piece I wasn’t crazy about was the introduction of her friends Bud and Jan in Vancouver. I think Ms. 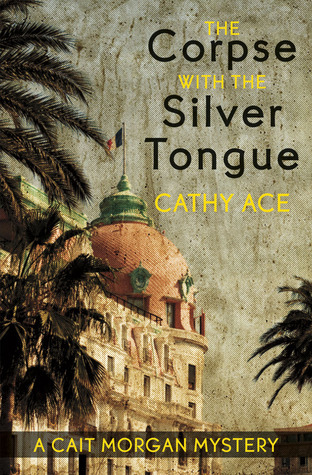 Ace was setting things up on a personal level for future novels, but their presence didn’t add much to the French murder mystery taking precedence in the book. It felt a bit forced, and I think the main mystery would have been more than enough of an introduction to Cait Morgan. Overall, a fun read with a cast of interesting suspects. A huge thank you to TouchWood Editions for providing me with a copy of this book in exchange for an honest review. I got an ARC of Dotty Dowager a month or so ago, I really enjoyed it. Looks like it is going to be a fun series! This is the first book in Cathy’s Cait Morgan series. Her newest one (The Corpse with the Sapphire Eyes #5) should be out now, and she has a sixth in the works for fall! As always, great review, beckmank! I also just finished the latest Cait Morgan coming out on Friday, I will be posting a review for that tomorrow. The Cait Morgans are fun, but I love the setting of the Dotty Dowager in England and Wales.